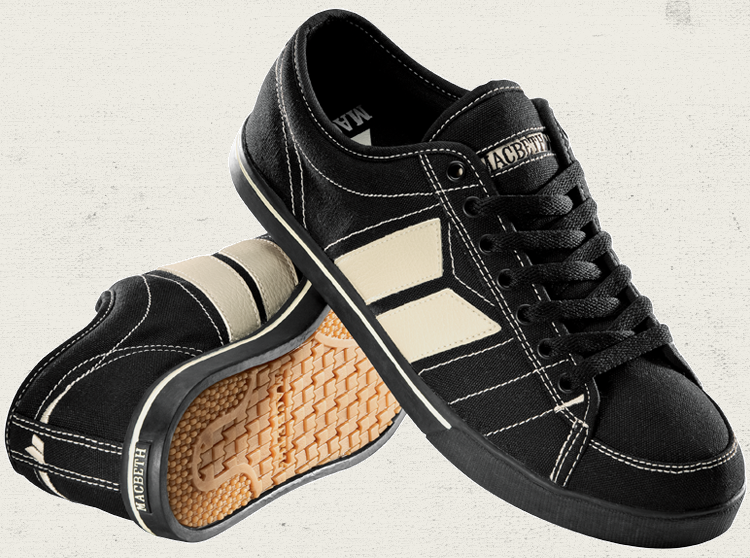 The Manchester from Macbeth is a sturdy little canvas number. And though a few years ago I wouldn’t think much of a low profile shoe like this, the recent output from other legit skate companies makes me think Macbeth was up to something all along. A little history here, Tom Delong of Blink 182 founded the company back in 2005. The idea being that their was an esthetic that kids wanted, but ethically couldn’t give their money to Nike or Converse, etc. While I am no fan of the works of Tom and associates I can certainly get behind Macbeth’s efforts. Easily more then half the shoes they sell are Vegan. The Manchester has a nice vulcanized sole and a double density insole, so when you toss you’re board down a five set your heals aren’t going to catch fire. Bolts! Get these at MooShoes for 50.00 cheaper than Zappos! If you’re in NYC go and pay MooShoes a visit (beware the guard cats if you value your arm blood) at 78 Orchard St. Then walk yourself ’round the corner to Tiengarden at 170 Allen St. for a Vegan Ham Sandwich.